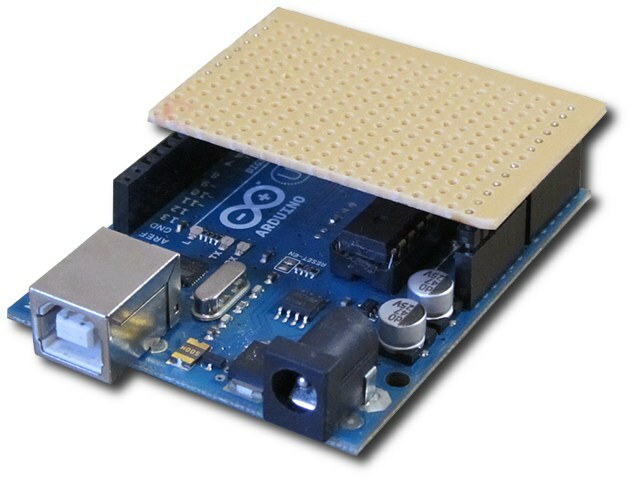 In this project you will build a small Arduino shield from stripboard that only uses some of the Arduino pins. The shield is intended for building small projects on, some of which will be published on this website. To build this project, you will need a piece of stripboard that will be cut to be 20 holes long (along the stripboard conductor length) by 13 holes wide. Single row pin headers that have pin spacing of 2.54mm are also needed: two 6 pin headers and one 8 pin header, or cut the required headers from a longer header such as a 40 pin header. You will need a drill bit of about 3.5mm diameter for breaking the stripboard tracks. A file will be needed for filing the stripboard edges clean after cutting the stripboard to size. A vice will be needed to hold the board while filing. Long nose pliers, half-round nose pliers or similar will also be needed. You will need your soldering equipment: A soldering iron and solder wire. It is important not to power up the Arduino with the shield plugged in as this will short out pins on one side of the Arduino to pins on the other side of the Arduino. After building a project on the shield, the tracks will be broken at various places so that no Arduino pins will be shorted out. This video shows how to build the shield. 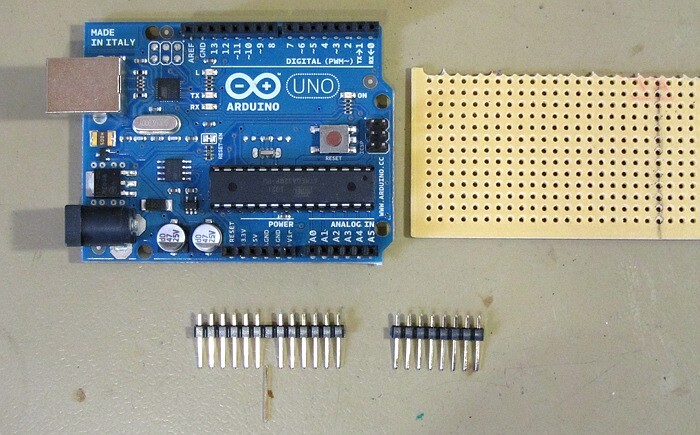 The idea is to solder the pin headers to the board upside-down as shown in the video. 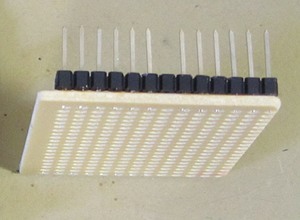 The black insulation of the pin headers is then pushed to the other side of the pins – against the board. The pin headers soldered to the board can be seen in the photo below.